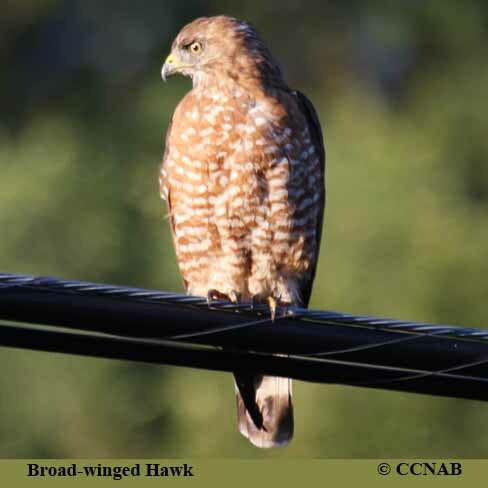 Species: The Broad-winged Hawk (Buteo platypterus), is a crow-sized hawk and is the smallest member of the buteos seen in North America. 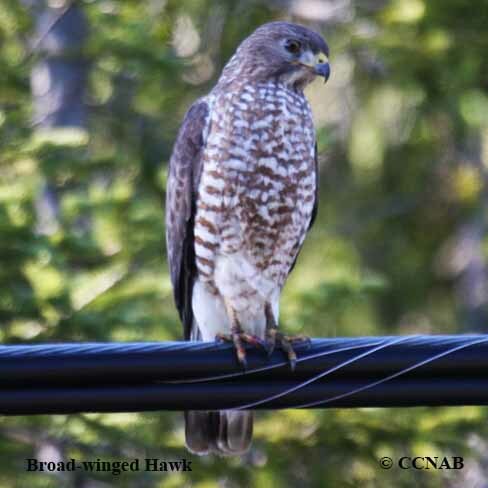 This unassuming bird of prey is found in forested areas. 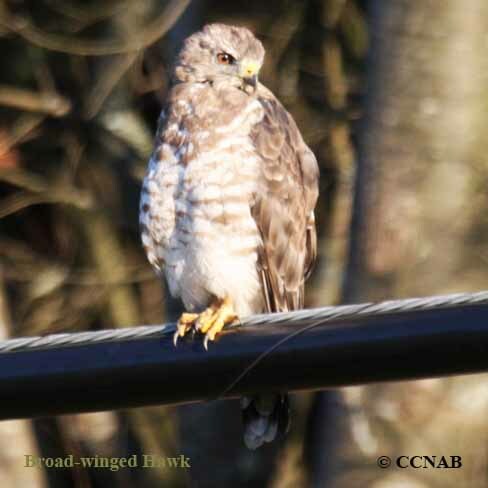 It is commonly seen along highways and roads, perched on utility lines, watching for any movements in the grasses or on the forest floors. 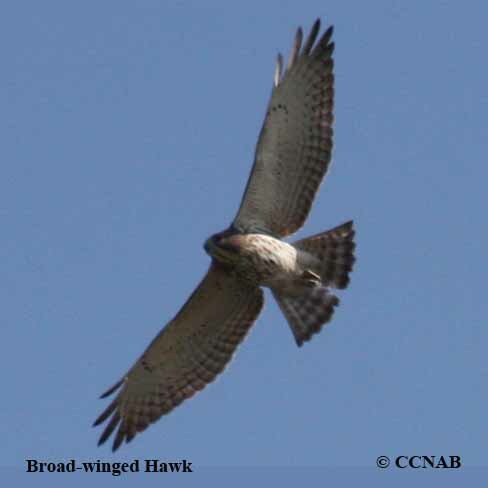 This particular hawk is known for its large numbers and flocks during its migration period. 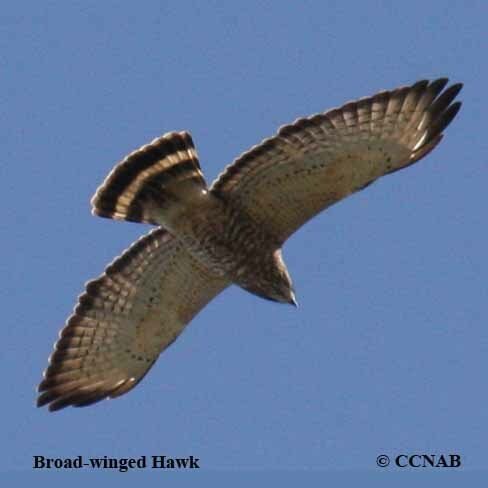 These flocks are called "kettles", in which hundreds of Broad-winged Hawks can be seen at one time. Numbering in the hundreds of thousands, when all the flocks are counted at the end of their Fall and Spring migration periods. Distinctions: The males and females are similar in appearance, females are larger than male birds. Brown back, wings and tail feathers. Lightly coloured tan breast, with large rufous to reddish brown streaks, each streak made up of series of triangles, one above the other. 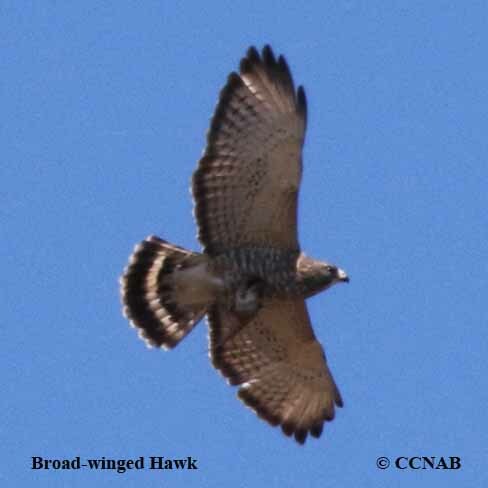 Easily identified in flight by equal size large bands on tail feathers, showing light and dark rows. Dark morphed birds are possible, usually located in the western regions. Juveniles are similar to the parents but with a softer look and without the same sharp definitions. Nesting: Three to four white eggs, with brown spots, one brood per year. Builds its nest in trees, either in a deciduous or mixed forest. Distribution: Found throughout most of eastern North America's forests. Seen from Nova Scotia, forming a finger reaching west, out into the prairies and beyond to British Columbia, down through the central USA states to Texas and east to Georgia. Migrate into South America for the winter months.